Travel guitars are not just for travelers. Although convenient for travel by plane or train, they’re also great for beginners because of the smaller neck and body of the guitar. They’re great to carry to a weekly guitar lesson, too. Normal guitars with a scaled-down form factor that could conceivably function as a primary instrument. Note that any guitar with a smaller body could serve as a travel guitar. This includes 3/4" dreadnought guitars, parlor guitars, and the like. If you want a guitar suited both to travel and functioning as a primary interest, look no further. The Taylor GS Mini is an excellent quality travel guitar, but also perfectly suited for general use. The Baby Taylor is one of the nicest travel guitars. It will normally fit easily in the overhead compartment in its included soft gig bag. $350 Martin LX1E "Little Martin"
For most students looking for a travel acoustic guitar, this is probably one of the best options. It’s reasonably compact, and fairly sturdy. The feel is pretty good, as it’s made by a company that enjoys its reputation of building good guitars. The top is made from solid Sitka spruce, which is probably why the tone is so good. Another reason may be good bracing, which also affects amplification and may need to be adjusted for guitars of this size. The back and sides are a synthetic material called "mahogany HPL", which some players have reported is not very durable. The concern is that if the guitar warps due to heat and humidity, it can never be restored to its original shape. So keep it safe from extreme temperatures. It’s best to return it to the gig bag after playing. 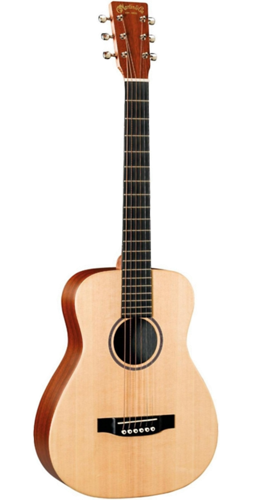 Clearly an answer to the Baby Taylor and Martin LX1, but at a cheaper price. If you’re looking for a compact and serviceable travel guitar, this might be your best bet. Buy it: Recording King Mini Dread[? ]Affiliate Link. In a pinch, the baritone ukulele makes a great travel companion for the guitar player. Its four strings are tuned to DGbe, matching the top four strings of the guitar. We strongly recommend that every guitar player owns a Traveler, because it is by far the most compact and durable travel guitar, and certainly passable. However, we also recommend you don’t rely on it for periods of longer than two weeks. A strap is a must accessory as the included stand is not terribly effective, slipping down the leg and making the guitar difficult to hold without a strap. There is almost no sound output from either the acoustic or the electric version of the Traveler; however, both have electronics. Perhaps the best way to amplify on the road is to get an Apogee Jam, and use that in combination with either a laptop or an iPad with Amplitube or Garageband. The Traveler is quite durable, but only time will tell what it can withstand. 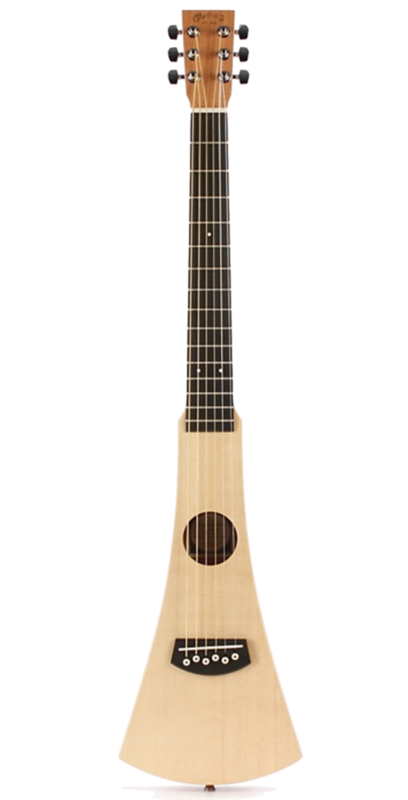 The Martin Backpacker, if a bit ugly, is probably the smallest-bodied guitar with acoustic amplification that there is. These are fairly easy to find in music stores if you want to try one for yourself. Due to the unusual shape of the body, it is not very easy to hold. Similar to Traveler guitar, but bigger and easier to hold. This guitar also has almost no volume, so an Apogee Jam or similar is recommended. Due to the full-size wire-frame used, this guitar is actually fairly comfortable to hold, while also being much more compact than a "real" guitar. Overall it seems pretty durable but only time can tell.